7am. Upper Hamilton Lake. I force my eyes to open. 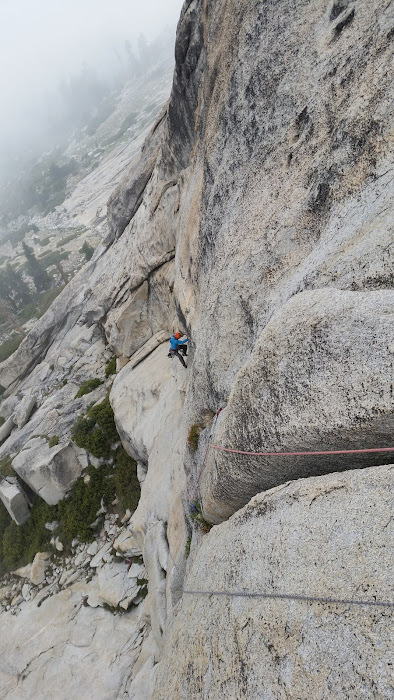 Feeling like a truck rolled over my semi-conscious body I realize it was not a truck - about 9 hours ago Luke and I stumbled into the camp after climbing The Valkyrie (V 5.11+/5.12-) on the Angel Wings. A few minutes of hesitation, I gather my thoughts, turn over and exclaim, "Rise and shine brosef!" I notice no excitement in Luke's eyes as I pour the water into the stove. Honestly speaking I am not excited about hiking seven miles and attempting to climb a 1,500 ft new route. I am even less excited to eat oatmeal with instant coffee for the fifth day in a row. But I can't let Luke know that there is a way out of our plan! "Today will be a blast and you will remember this day for a long time," I promise. A plan is a plan and the only way out is if one of us needs medical attention. 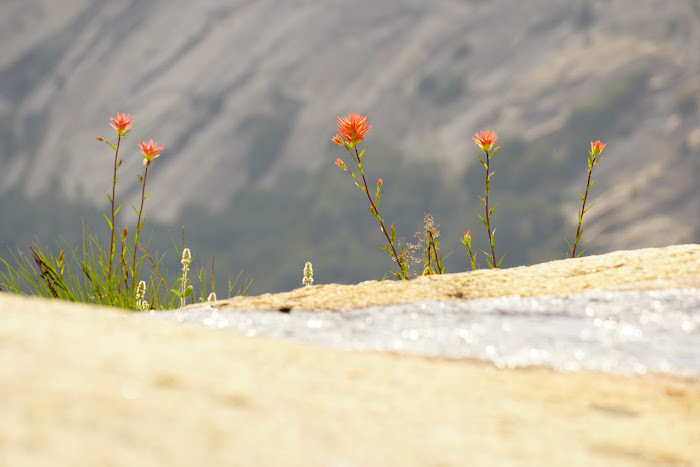 Even though we feel like our lower extremities are falling off and the arms can barely move, we don't pay much attention to common sense or a faint voice of reason screaming for a rest day. Route turned out to be like a slightly harder version of Charlotte Dome's South Face with a 100M chimney system. Fun cruiser climbing with great rock for majority of the climb - great time out! After the final date with the world's best pit toilet I realize instant coffee is not that bad and we start the descent to Lone Pine Creek cut off. My smile is quickly removed by the two annoying blisters on my right foot. "F*#k, it will be a long day," I mumble and continue following a deer down one of the five hundred switchbacks. In the beginning of the year I made a commitment to avoid climbing with annoying people and to avoid climbing on the days I don't feel like climbing. We drop the backpacks, set up the tent and continue our journey towards the Prism. There are giant clouds hugging the surrounding ridge-lines but the sun continues to burn through our skin. We sweat our asses off as we slowly gain elevation hiking through the overgrown jungle in the beginning of the Tamarack Lake trail. Our feet are not any better and neither is the weather. There are multiple reasons to bail but the easy way out seems like a silly option a mere mile away from our climb. I dread every step I make towards the cloud infested peak in the distance, as I question the above mentioned commitment. Even though I have one of the best possible partners, this is not the day to tackle a challenging climb. Luke looks even less excited as I shout "The honey badger don't care!" As we gain more elevation, I wonder if he questions the sincerity of my act. As I look up at the wide crack system that ascends up the middle of the Prism, I want to vomit. FML, a hand crack would be much appreciated today. By the time I start the first pitch it is close to 1pm and we are in a full white out. "Should we bail?" 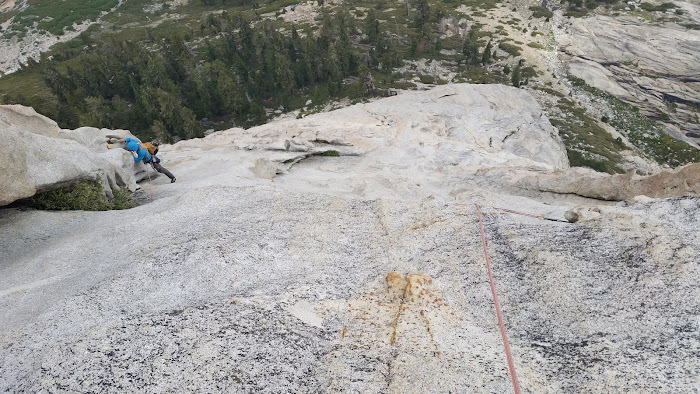 I slab climb below a giant overhang placing pro in a dihedral to my left. 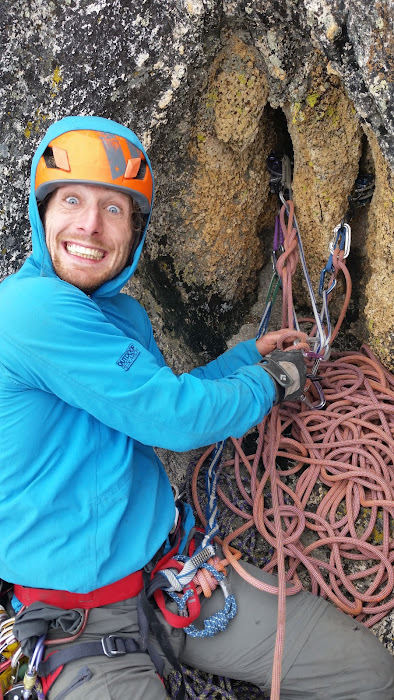 On the second pitch, I pulled a roof and found that the fingercrack that is supposed to get me into a large offwidth, is actually a seam. "Should we bail?" Even though I was bummed, there was a plan B - continue traversing below the giant roof and look for a way into the second system. 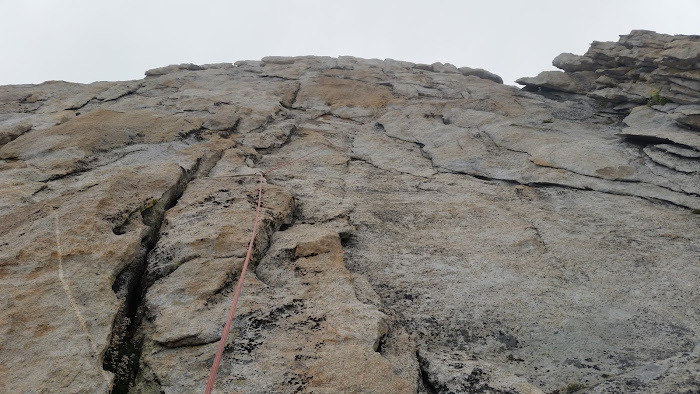 For a while, I wondered why are these direct and obvious wide features have been ignored by the guys that climbed new routes on this formation in the past. As I dug out more than a body length of bushes and pounds of dirt out of the crack, I realized those guys knew better. "Should we bail?" It took close to an hour to make the beginning of the giant offwidth climbable. 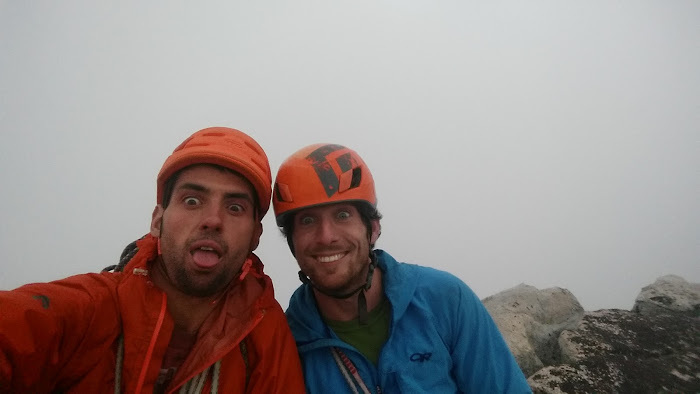 If the best climber is the one having the most fun, I must of been very close to the opposite. After the digging was done however, the route unfolded like a dream. 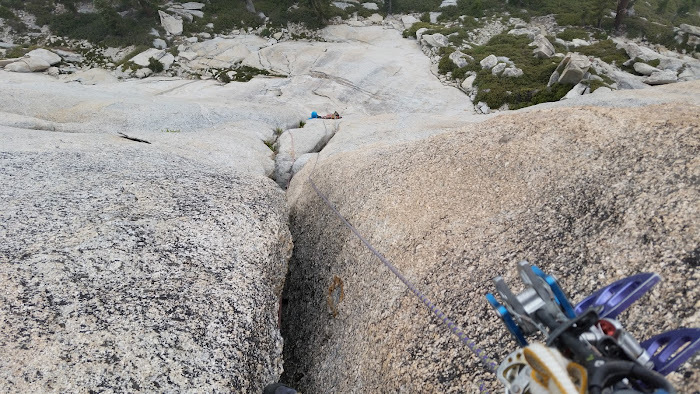 I took another full 60 M pitch of fun wide climbing, protected by small to medium cams in the back and we were on the move. Luke took over for two pitches of incredibly fun face climbing and at this point I was challenged with trying to feed enough slack. We resumed having fun and my desire to bail transformed into a prayer to prevent any possible precipitation. We kept climbing a direct line up the middle of the formation till we joined the other routes at the apex of the wall. Few hundred feet of simul climbing up a cool ridge got us to the summit proper, where we recovered a Nalgene with a register. 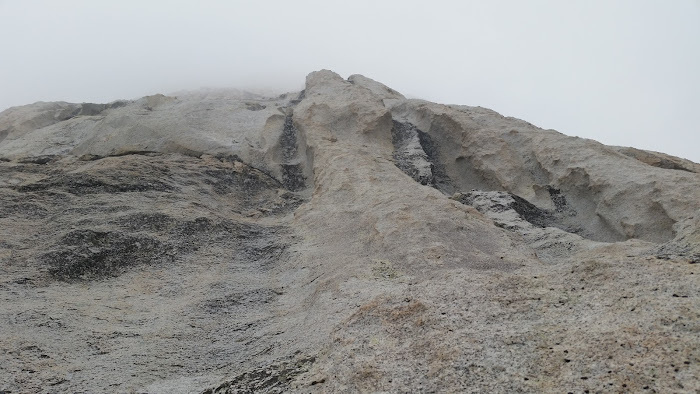 Turned out we did a fourth recorded new route on the formation and did the sixth recorded ascent. From reading the summit log, I gathered that while climbing one of the 'new' routes on the Prism, one of the parties found an old piton. 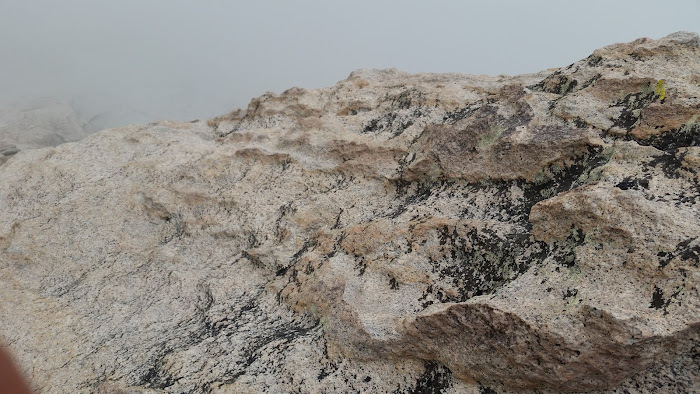 It made me wonder about the history of the climbing in the region and all the unrecorded climbs that were completed by the mythical someone and many other climbers that passed through the range of light. 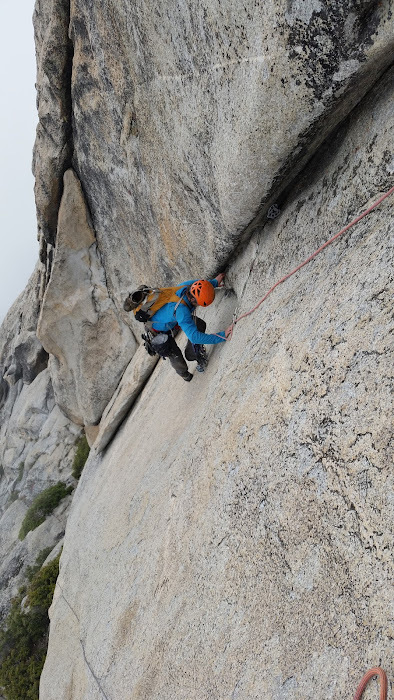 A combination of wide, featured face climbing and a variety of cracks we have climbed kept us grinning till we traversed the entire ridge to the rappell stations. Then we faced sad necessity of a three mile hike back to camp. To my surprise the excitement of climbing something SERIOUSLY AWESOME did not wear off till we had our dinner and passed out in the tent. 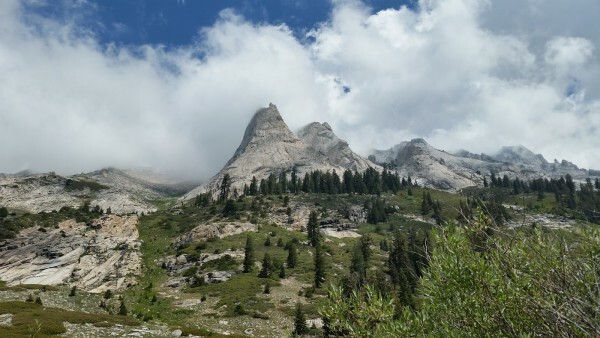 A big thunderstorm kept us from starting the mammoth (14 miles) hike out via the High Sierra Trail till late afternoon, and we did not mind that for a minute. We had time to reflect on a roller-coaster type of a trip. Some pleasant surprises, some unexpected road-blocks, a load of fun, many memories and things to digest for the future. I don't think I was able to take it all in till I had some decent sleep in my own bed...and then...to everyone's surprise.....I wanted to RETURN! Vitaliy M. is an annoying gym climber from San Francisco. Boy have you been on a roll this year, Vitaliy! Thanks for all the trip reports. Good stuff, Mr. M. You are nothing if not prolific. Wish I had a partner like you 10 years ago. Not that I couldn't use one now but I don't climb nearly as much anymore. Thanks for the fine post. Those days were a roller coaster. So many great moments, so damn much hiking and hard work. The weather on the whole trip was also a huge factor. The nuking storm on the 4th of July. Seriously better than fireworks. The heatstroke on the 5th and then the full whiteout day on the 7th... MAN. It was funny how fast my mood turned around. 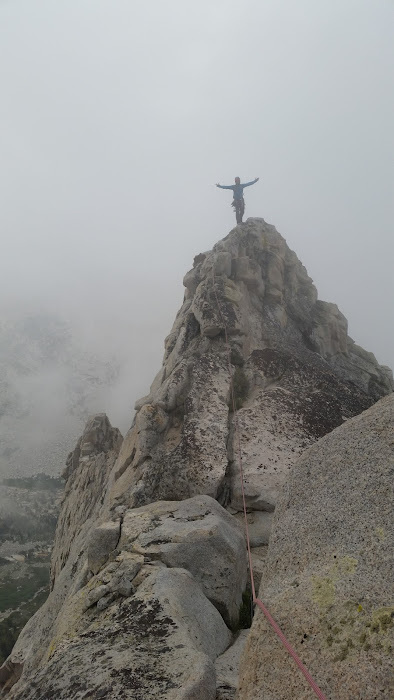 It was so dismal for a long time but then 400feet of blisful easy climbing on perfect stone was just the ticket. The route would go and the psyche transformed. My prudish sensibility appreciates the "Wizard's Sleeve" naming for that belay. Really that sh#t was magical, right when I was running out of rope too! When you say 'whiteout', you're talking fog and clouds, right? so the boy can crush. What is this "top notch" rock you refer to?? That whole area is a giant pile of choss!! Go somewhere else where you'll be much safer, be in cell phone range if you get skeerd of some runout 5.5 jug haul, white clouds start rolling in, the wind gusts over 5 mph, or you drop your roll of tape. It is honestly damn good. 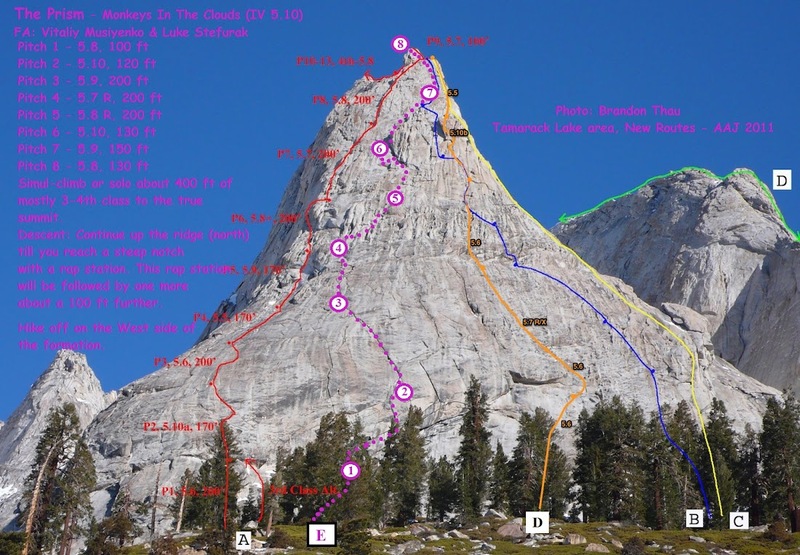 So much variety on the climb and it is a sustained climbing on moderate terrain. Really worth repeating I think. Wouldn't make a MP page if I thought it was sh#t.